Irritation and inflammation of the eye can be caused by a bacterial infection, overexertion, or foreign objects in the eye such as sand or dust. A red eye, also called “pink eye” is generally inflammation caused by bacteria. An inflamed eye can be sensitive to light as well. 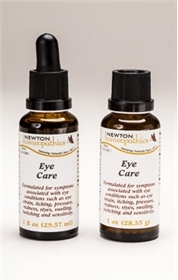 Relieve pain, itching, swelling, pressure, red and tired eyes, and pink eye, with the use of Eye Irritation. DIRECTIONS: DO NOT PLACE IN EYE - Contains Alcohol. Take 3 to 6 drops on the tongue 2-6 times daily until symptoms abate. INGREDIENTS: Aconitum napellus, Apis mellifica, Argentum nitricum, Arsenicum album, Causticum, Euphrasia officinalis, Gelsemium sempervirens, Mercurius corrosivus (sublimatus), Natrum muriaticum, Nux vomica, Phosphorus, Pulsatilla, Rhus toxicodendron, Ruta graveolens 15x.Echinacea purpurea, Salix nigra 3x. Alcohol 20%.